Enter to win one of two eBooks. 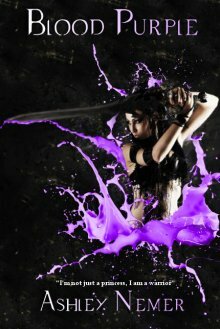 One copy of Blood Purple and one copy of Maverick Touch will be given away! Ends 5/31/2013. Hi, my name is Ashley and I am a writer. I write for me, not because I want to but because I have to. I have spent thirty years building up to this moment, the moment of truth. This will be the pivotal moment of my life because I am turning a corner, working to making myself stronger, better and a conqueror. So now I sit here and reflect on what I’ve done for three decades, what I’ve become and what I’ve accomplished. I remember my childhood, so vividly it’s like I can relive it in a blink of an eye. When you think back on your childhood, what stands out to you? For me, there are a few things that shaped my world. It’s 1991, my mom was picking my brother and I up at the airport from visiting my father in Texas. It’s the first year of their divorce and here I am, eight years old and my life’s purpose hits me like a ton of bricks. Looking at the television monitor I see him. The President of the United States. I had no idea who he was; just that he had captured my attention while standing in front of the countries seal. I knew what I wanted to become, the first female President. I declared it that very day to my mom’s friend who was explaining to me that it was President Bush speaking to the nation. From that moment I had one vision, the White House. In 1993 my dad enrolled me in my first class of taekwondo. I was this shy little girl, who had no idea how much this sport would come to shape my existence. In 1997, high school. We had one elective in ninth grade that could be anything we wanted. My mom and I looked over the options and there was only one that was for me. Debate. How little I realized that all these things would turn me into an outspoken, strong, creative and unique individual. Looking back I clearly see how each item turned me into this person writing here before you. I spent the 90’s in training, either with my debate team or with my taekwondo family. Forty hours a week combined there was no wild and crazy social life for me as a teenager. But there was fun. Debate taught me how to think on my own, write ideas down on the spot, research and invent speeches that would captivate my audience. Taekwondo taught me discipline, perseverance, loyalty and patience. Both roads were not easy, both had challenges and accomplishments. I would watch my friends succeed where I failed, I would have to force myself to keep plunging on. Failure was not an option. Nemer’s didn’t quit, and we certainly didn’t let others dictate our fate. We took each obstacle as a challenge to prove who and what we were. August 2001, Sam Houston State University was calling my name, a small fish in a sea of unknown creatures. Business major, Political Science minor. I was still convinced I was going into politics, where I could make a difference in the world. Until Fall, 2002. I had one college professor who hooked me, he changed my whole outlook on my future and I saw my new calling, Economics. I fell in-love with this area of study. Everything about it kept me begging for more; up to the point where it was all I wanted to do day and night. Political Science and Economics kept my mind filled with knowledge and ideas. I was learning more than I could ever imagine. Sociology and philosophy proved to be the most thought provoking of my classes and that’s when my writing really became a part of my being. I started writing poetry and actually had a few poems published. Where that book is at, I have no idea, a box somewhere, but the experience laid the ground work for what I had in store almost a decade later. Flash forward eight years, graduating college, finding a job (not in the sector I of course planned) and starting a life with my husband I found myself missing something. An intangible something that I couldn’t put to words. And then I found a writing group and finally, I felt complete. It’s here that I met my writing partners, the ones who pushed me to be a better writer. A community of women and men full of encouragement and cheering. A year later my first novel birthed and the Algula were born. Zayn, Nikole and Haydar had taken over my mind and fingers, pushing out my first novel,Blood Purple. Is it a masterpiece? To me, yes. It is about Arabic Vampires, specifically, Lebanese. I am half Lebanese and I have always had a desire to seek out my heritage and find out WHO I am. This really is a book about my path of discovering myself. I grow with each word I type, each scene I create and with the close of each book I get closer and closer to the final discovery of what I was meant to be. My characters are strong and powerful in their own rite, but they are also weak, they crumble and hit rock bottom, and are forced to fight their way back to the top. I weep with each of my characters when they stumble, I rejoice when they succeed and here at this moment in time I am not even halfway through the final book of this story line (Blood Green) and I have no idea how it is going to end. I discover just like the reader, with each page that passes by. Nikole, the heroine, and Leigh, the antagonist, are two sides of the same coin. And I’m that coin. Those that know me can see the similarities, in their personalities. Even an undertone of the story line is based on how I have felt at different stages of my life. The Blood Series is Ashley. Of course, it’s amped up for dramatic effect and excitement of reading but when you stop and analyze different parts you will find me, raw and exposed. But it doesn’t stop here; next you will find my mystery series, Maverick Touch. I decided to participate in the NaNo writing of 2012 and I had no idea what I was doing or how I was going to do it, but I birthed one of the best things I could imagine. Nadia Maverick, a quirky news reporter that was inspired by April O’Neal of the Teenage Mutant Ninja Turtles. She uncovers some deadly crimes which she believes are being conducted by Carlisle Ali, a Dexter type character. Authors tend to write what they know, and in The Blood Series I wrote what I knew, myself. But in Maverick Touch: The Cat I was bound and determined to let this flow free of ‘Ashley’ influence. Oh boy how did I fail. When I read my book for the first time cover to cover I sat on my couch in astonishment. There I did it again, me. I’m in these pages. But not just me, people I love and care about. I see my best friends, my brother, and my husband in the different pages. That’s when I finally accepted that as a writer I am going to put bits and pieces of me into everything I write. Now, May 22, 2013, a new decade is starting. An Era of Success – that’s what I am going to call it. Because that’s what is going to happen. Did I achieve any of the goals I started out having in my youth? No. But I did achieve one thing; I’ve left my mark on the world. As a child I thought politics was how I was going to be remembered. As a college student I thought I would become an Economics professor and help shape leaders of the future. But now, as I sit here in my true calling, I see I am going to leave my mark in fiction. I’m going to provide the relief and inspiration to others with words. So in my next thirty years here is what I will accomplish. I will write not one best seller but many. I will touch a mass audience of people and show them who I am and what I am capable of. I will live my life in a way that happiness isn’t just out of my reach but in my grasp day in and day out. And when it is all said and done, May 22, 2043 I will look back and smile because I know I will have done what I was meant to do. Write. I am giving away one copy of Blood Purple and Maverick Touch: The Cat to two people who comment.